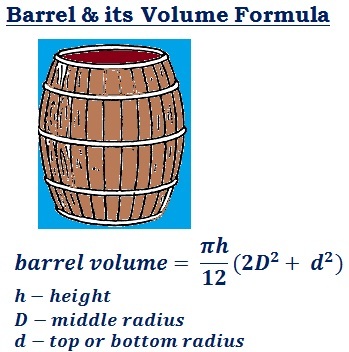 cylinderical barrel volume calculator - step by step calculation, formulas & solved example problem to find the total volume of the cylinderical barrel in different measurement units between litres (L), gallons , cubic inches, cubic foot etc from the given input values of middle & top or bottom radius. In geometry, Barrel is a large round container, usually made of wood or metal, with flat ends and, usually, curved sides. A small barrel is called as keg. The below formula & step by step calculation for example problem let the users to understand how the values are being used in such barrel volume calculations. The below step by step calculation for example problem may be useful to understand how the values are being used in the mathematical formulas to find the volume of the cylinderical barrel. A cylinderical barrel having the middle radius D = 18 in, top & bottom radius d = 15 in & height h = 10 in. What is the volume of this barrel? If the input values are in feet, refer the below table for the conversion factor. The respective conversion factor should be multiplied with the result calculated by the above mathematical formula to find the volume. The volume of a barrel may required to be calculated in SI or metric or US customary unit systems, therefore this barrel volume calculator is featured with major measurement units conversion function to find the output values in different customary units such as litres (L), gallons (gal), cubic inches (in), cubic foott (ft), cubic meters (m), cubic centimeters (cm) & cubic millimeters (mm) by using this below conversion table. In the field of area & volume calculations, finding the barrel volume is important sometimes. The above formulas, step by step calculation & solved example may helpful for users to understand the how to calculate barrel volume manually, however, when it comes to online to perform quick calculations, this barrel volume calculator may be useful to find the results.